Sometimes you might ask yourself this question. “What would I ever do without my wheelchair?” That’s a question people ask all the time, and sometimes you find yourself without your wheelchair and unsure of what to do next. If you are in need of a heavy duty manual wheelchair, we have reviewed the best six on the market for 2018 below, and we’re going to help you decide which one is right for you. This chair is one of the most appealing wheelchairs on the market. It sits and rides well with a lot of padding and variations. This heavy duty wheelchair has a lot to offer. It comes with a solid carbon steel frame to prevent rusting and chipping, plus plenty of padding on the back, buttock area, and armrests. This helps to prevent stiffness and soreness even after an extended period of time. In addition, the leg area has padded leg rests, which is a nice tough, and there are removable footrests at the bottom. This chair also features a 500-pound weight capacity and extra wide seat and frame so it can accommodate any body type. We love the way this chair navigates. Its movement is smooth and fluent, and it rolls easily on whether it’s being pushed from behind or rolled forward by the user. One drawback of this chair is that it may be difficult for people of larger sizes to move the chair on their own. The wheels are solid and somewhat spongy, making it difficult to move on outside surfaces that are rough or uneven. For the price of this chair you get a lot. There is not quite as much padding as other options but the chair rides well. This is one of the most durable chairs available at a low price point. It has heavy-duty upholstery that is dual-embossed for additional reinforcement. This chair is rather, however, is simple and does not come with a lot of the features you might expect even in the low price range. 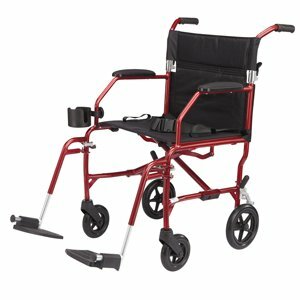 There are no padded leg rests or areas or storage areas, but the wheels are solid and are easy for the user to roll themselves. The chair is also lightweight and easy to move around. It navigates well in and out of doorways and is primarily designed for indoor use on smooth floors. This chair offers all the bells and whistles available. You get all the comfort and mobility features you need. This bariatric wheelchair is incredibly durable and made from high strength steel. The chair also folds up easily, so even though it is 53 pounds, it’s simple to transport. What’s more, the chair comes with a stabilizer bar to prevent flexing or warping of the seat area. 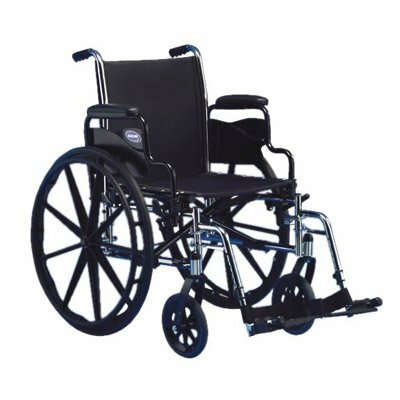 When compared to a standard transport wheelchair this one is much more comfortable and features a much more padding. It also has calf loops and footrests which many seniors consider essential. One issue we did encounter with this chair is that the handles on the back feel fragile and flimsy If you are a caregiver and you need to push your loved one around on a regular basis, this may not be a good long-term option. This transport chair serves its purpose well and is durable and sturdy. 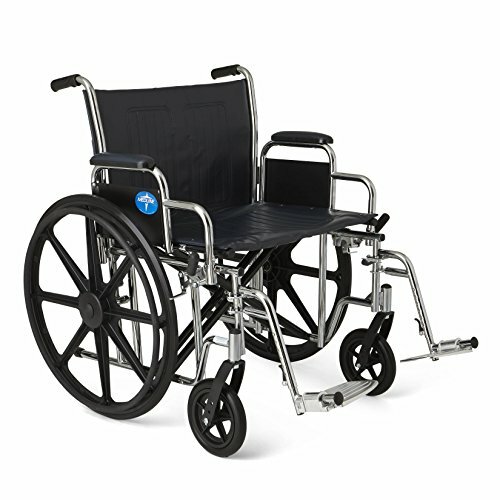 This is a standard transport wheelchair with a few stand-out features that we appreciate. It’s built with a push button footrest that is fully adjustable, and the back on this chair folds easily for transportation and storage. This Medline chair also features several storage areas as well as a convenient cup holder for drinks. The fabric on this wheelchair is made from nylon, and there is plenty of padding on the back and the armrests to make this chair comfortable. It also has padded leg rests, a seatbelt, and swing-away foot holders. The total weight of the chair is less than 15 pounds, so it is convenient and easy to travel with. Despite some of its great features, the navigability of this chair is problematic. Some models of this wheelchair are difficult to steer, pulling to one side or the other. This heavy duty chair is reinforced to make sure there are no issues with stability. It can support up to 500 pounds. This heavy-duty chair is highly reinforced to hold a maximum weight capacity of 500 pounds. The Drive Medical chairs also stand out because they are highly customizable. You can choose from a few different sizes and heights to meet your needs. The gussets on the chair are reinforced, and the chair has a smooth ride. We also noticed a huge difference sitting down in this chair compared to the competition. The chair feels stable beneath you, and there’s little risk of tipping over or breaking a wheel..
As for comfort, there is plenty of padding including a well-padded backrest and seat. The armrests are also padded, and the footrests flip away so it’s easy to get in and out. The Invacare chair is customizable down to every last detail. This makes it great for people of all sizes. Almost everything about the chair can be configured to meet your needs, making it the gold standard for customization. It also features a sturdy build. When you sit down, the chair feels stable and durable. When you are manually rolling around by yourself, the chair moves nicely through doorways and around obstacles. The weight capacity on this chair is 350 to 450 pounds, and it has plenty of padding on the back, bottom, and arms to keep you comfortable even when siting for long amounts of time. The leg rests are also adjustable, so this chair can accommodate a range of different heights. We believe that every wheelchair should be highly adjustable because not everyone is the same size, has the same build, or even has the same preferences. You should decide how you want your chair to fit; not the manufacturer. What should you be looking for in a heavy duty wheelchair? There are many different features to consider, but we’re broken down the most important things to consider before making your purchase. Even if the manufacturer claims that their chair is heavy duty, it’s worth doing your own examination. You should see additional welds or ferrules at the joints of the chair to prevent breakage, plus extra fabric on the seats and backs to avoid ripping. This chair should feel secure and stable when you sit down, leaving no concern about tipping over or falling through it. Sometimes if a chair is heavy duty, it becomes too bulky to move around well. This is something to test out before buying. If you are buying the chair online and can’t test its maneuverability, try looking up reviews to see if other buyers found it easy to navigate. An agile chair should have well-treaded tires on it. Pneumatic tires are also a great option because they move well outside as well as inside. Some heavy duty manual wheelchairs are difficult to roll manually for seniors who with larger body types. Make sure to test this out before buying. Comfort is something you never want to sacrifice no matter what kind of chair you are getting. Make sure the chair has ample padding on every section and that it looks durable. You want to make sure these pads will not flatten over time. Also keep an eye out for things like storage pouches and cup holders. If you are spending a long time in this chair, you’ll want to have easy access to your things. This is a big one for us. We believe that every wheelchair should be highly adjustable because not everyone is the same size, has the same build, or even has the same preferences. You should decide how you want your chair to fit; not the manufacturer. We appreciate chairs that come in varying sizes and have a lot of removable parts like armrests and leg rests, which can help you roll up to a table if you need to. Having an adjustable chair ensures you have the perfect size to meet your needs.